There is only one feature of this drawing that brings out the true essence of Erik Lehnsharr: his eyes. They are so weathered and worn and deep red with anger and fatigue. As he furrows his eyebrows, they cast a shade over his pupils and irises and reflect the effect his mask normally has. This brings sinisterness to his visage and the acute angulation heading towards his nose also brings a focused glare at his adversary. There is a faint pink tinge to his sclera that accentuates the relentless struggle he has endured in order to bring mutants to his order. It is almost as if he hasn’t slept in years and remains tormented by his failures, but he remains stoic. As we all know he has yet to succeed and is currently playing the paternal mentor to Cyclops. However as he stares at us with such conviction, he invokes fear and suspicion because beneath it all, we all know he still thinks his way is best. There is a betrayal at hand and as transient as his newfound role may be, he is biding his time and choosing his moment carefully. The rest of the cover is a lovely deep red and well shaded interacting which his headshot. I find it interesting that his mask is formed from barbed wire which is an amazing effect. It represents his history of being the master of magnetism, shielded from Xavier’s telepathy but also of his childhood. 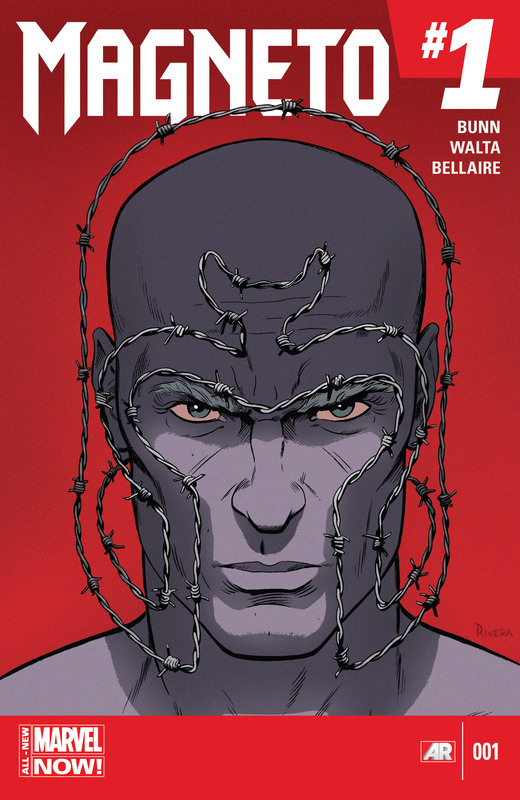 Magneto’s persecution by the Nazis is a well know origin to his character and the wire signifies this struggle. The fact it is shaped to his helmet is a fantastic analogy to the evolution of villainy from persecutory foundations. From what appears to be a simple headshot cover, emerges a nuanced and earnest character exposition.